Powers/Abilities: No superhuman powers, though he is naturally strong and athletic. All of his power lies in his control over the three magical artifacts in his possession: a magic carpet, golden scimitar and belt-sash. The carpet is keyed to respond to his thoughts alone and only stays aloft while he is consciously controlling it. It can attain any speed or height the Knight commands it to, though above 200 miles per hour or higher than 20.000 feet above sea level he has considerable trouble breathing. The carpet is more than a mode of transport, it can also be used for protection. The carpet is virtually indestructible, resistant to flames, bullets, frost or friction. The Arabian Knight's golden scimitar is a strong melee weapon, capable of emitting beams of magical energy with a maximum force of 20.000 pounds per square inch, enough to rupture a three inch thick steel plate. Its energy is activated by his will alone. He can command it to shoot at whatever force he wishes. Its enchanted nature only makes the blade wieldable by its owner. The magical energies inside the blade will attack anyone else who tries to use it. The belt-sash the Arabian Knight wears around his waist can also be mentally controlled, serving as bonds, lariat, whip or climbing rope. It is made of the same substance as the flying carpet and shares its nigh indestructible properties. It can magically extend in length to almost ten times its original four foot length. (Incredible Hulk II#257 (fb) - BTS) - 13th Century - One of Abdul Qamar's desert nomad ancestors was chosen by Eastern magicians to fight the Egyptian demons Gog and Magog. After a prolonged battle, the nomad sealed the demons inside a mountain tomb, losing his magical weapons there. (Incredible Hulk II#257) - While guiding archaeologist Hassan Kareem to the tombs of Gog and Magog, Abdul Qamar came across a wounded Bruce Banner, who got stranded in the desert after one of the Hulk's adventures. Qamar, knowing Banner, decided to keep his presence a secret from the Egyptian authorities as he and his family restored Banner to full health. While Abdul took Banner on a tour of the tombs of Gog and Magog, their party was surprised by an earthquake that released the demons. In the confusion, Abdul got separated from the group and wound up deeper inside the tomb. While trying to find shelter, he actually stumbled upon a secret chamber that contained the sacred 13th century golden scimitar of legend. Calling himself the Arabian Knight, Qamar joined the Hulk in his fight against Gog and Magog. After using the scimitar to trap Gog inside his coffin, he figured that the world would be safer without the Hulk and decided to leave and seal the tomb while the green giant was still inside. As a remorseful Knight flew off on his carpet, he didn't notice the Hulk had freed himself after defeating his demon foe. (Incredible Hulk II#250 (fb)) - While scanning the Earth for Bruce Banner, the Silver Surfer picked up the Arabian Knight among the many international superbeings that dotted the globe. (Ghost Rider II#61 (fb)) - After receiving his powers, Qamar decided to dedicate part of his life to fighting crime throughout the Middle East. Chief among his enemies was the criminal empire of sheik Abdul Hurani. The Knight hounded Hurani for months, engaging his forces on multiple occasions. His magical carpet protected the Knight from their bullets, while his scimitar's energy blasts struck them down. Anyone else was overcome by the enchanted sash. (Ghost Rider II#62) - Frustrated at being continuously hounded, Abdul Hurani decided he needed to hire a super powered criminal to finish off the Arabian Knight. Hurani's choice fell on the Water Wizard (Peter Van Zante) whom he met by chance. However, Water Wizard's old foe the Ghost Rider followed him, ready to finally have his revenge. Misjudging the demonic hero's looks, Arabian Knight figured Ghost Rider was one of Hurani's henchmen and attacked. Before they seriously injured one another, the heroes were forced to team up against Water Wizard and his band of crude oil warriors. While Ghost Rider engaged Water Wizard, the Knight captured Hurani thanks to his sash. Both heroes were surprised by a huge explosion caused by one of the oil warriors. For a while the Arabian Knight thought Ghost Rider had perished in the blast, but when the motorcycle riding demon emerged alive and well, the Knight thanked him for his help and even awarded him one of Hurani's rubies as a thank you. 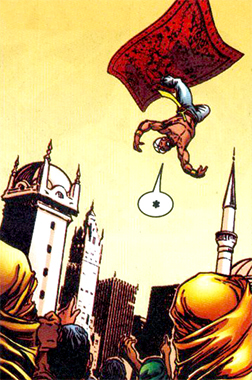 (Contest of Champions I#1) - Flying his carpet around Saudi Arabia, the Arabian Knight was transported away by the Grandmaster and a being known only as the "Unknown". When he arrived at an undisclosed location, the Knight realized he and a wide selection of Earth's heroes had been taken. Socializing, he encountered the Black Knight (Dane Whitman) and Defensor (Gabriel Sepulveda), Qamar and Dane Whitman discussed the mystic origin of their blades. Soon afterwards, Grandmaster and the "Unknown" appeared to the heroes and told them what was going on. Recently, the Grandmaster's fellow Elder of the Universe the Collector had died. Grandmaster sought to remedy this by daring the "Unknown" into a game. The entity had the power to restore life to the dead and the the cosmic gamesman challenged it to a competition that, should he win, would end with the Collector returning to life. Both players picked twelve heroes each to battle on their behalf. The Arabian Knight was chosen by the "Unknown". In battles of three the heroes had to collect a piece of the "Golden Globe of Life" to determine the winner. (Contest of Champions I#2) - The "Unknown" transported her team of three, consisting of the Arabian Knight, Iron Man and the Israeli superheroine Sabra, to compete against She-Hulk, Captain Britain and Defensor in an old ghost town. 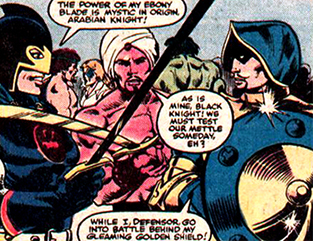 As the heroes of each team introduced themselves, the Arabian Knight expressed a severe disgust at the notion of fighting alongside the Israeli Sabra. Iron Man figured the Knight's disgust might also have something to do with Sabra being a woman. The three heroes split up and soon the Knight was attacked by the She-Hulk who managed to surprise him and knock the Knight off his carpet. Falling to his death, the Knight ordered his carpet to come to the rescue. 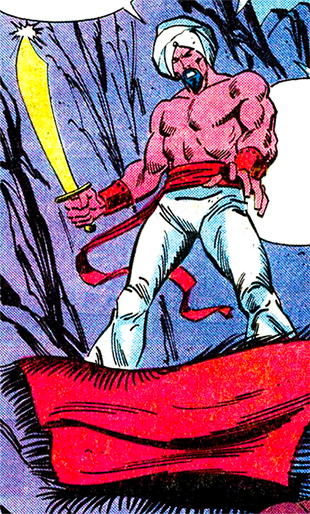 Arabian Knight then faced Captain Britain on his carpet, but his golden scimitar proved to be an equal match for the Captain's enchanted scepter. Their fight was disrupted by Sabra and She-Hulk. Arabian Knight ordered his carpet to save Sabra, but she rather coldly told him she'd actually preferred death to being saved by a Muslim. This gave Captain Britain a prime opportunity to knock the Knight out. When he came to, the Arabian Knight lucked out and found the Golden Life Piece in the furnace of one of the abandoned building. This settled the match and all players disappeared. (Contest of Champions I#3) - When all twelve participants had returned, it seemed the Grandmaster's team had won three Golden Life Pieces, while the "Unknown" only had one, thanks to the Arabian Knight. Promising to never use the denizens of Earth in his games again, the Grandmaster claimed his prize. However, all the heroes were shocked to see the "Unknown" reveal herself as Death itself. The embodiment of lifelessness held her end of the bargain and restored the Collector. However, the universe survives by balance so for any one lifeforce to return, another should be taken. That's why the Grandmaster gave up his life to make sure his "brother" lived. Death then departed, taking the Collector with her. In the aftermath, all the summoned heroes were returned to wherever they were prior to the contest. (Incredible Hulk II#279) - Arabian Knight was one of the speakers during the celebration of the Hulk receiving a full presidential pardon. Qamar, as a representative of his country, stated that he hoped Allah would guide him. (Rom#65) - Arabian Knight joined all of Earth's superheroes to help Rom the Spaceknight in opposing the Dire Wraiths' final plan of conquest: mystically merging Wraithworld with Earth. The Knight helped fight off the Wraiths, buying mutant inventor Forge enough time to complete his orbital Neo-Neutralizer satellite that eventually ended the Dire Wraith threat. (Rom#66 - BTS) - In the aftermath of the Dire Wraiths' defeat, the assembled heroes of Earth went their own separate way. (Marvel Comics Presents I#47/4) - Returning home from a trading mission to attend the birth of his child, the Arabian Knight was shocked to learn his village was under attack by demons. Hurrying home on his carpet, the Knight was telepathically contacted by a presence known as the "Demon of the Dunes" who claimed to be the source of the demon attack. The Knight, true to his unselfish nature, offered to sacrifice his own life to ensure his family's safety. Before anything came of this, Qamar was engaged by Saja, yet another creature, serving as messenger to the desert gods. Saja tried to warn the Knight of the "Demon of the Dunes" and his plans, but the bullheaded Knight refused to listen, and attacked Saja, claiming he had never heard of these Desert Gods. The messenger disappeared at the touch of the scimitar. Arriving at his village, the Knight was disturbed to see his family had already been turned into demons, chief among them Maya, his favorite among his three wives. The Knight used his enchanted sash to trap her and force the demon to depart her form. Freed, Maya informed Qamar his other wife Almira had given birth to a demon child. Shocked, he rushed towards the child who appeared to be the source of the demonic voices, the "Demon of the Dunes". The Demon-baby told the Knight this was his punishment for not using his gifts for the gods, while the townfolk begged the Knight to appease the gods by killing the child. When Arabian Knight refused to kill his firstborn son, the demon-baby cursed him, causing the entire village to disappear. The "Demon of the Dunes" had left Qamar's baby boy and assumed his original form, gloating in the gigantic loss of life. Angry, but too injured to face his foe, the Knight took his infant son and flew off on his carpet, swearing to avenge all the lives that'd been lost that day. (New Mutants Annual#7/2 - BTS) - At some point, the Arabian Knight discovered the "Demon of the Dunes" was lying: the disappearance of his village, wives and children was just an illusion. (Hulk Annual#20/3 (fb) - BTS) - The Arabian Knight joined the Pantheon and went deep undercover after their incursion into Trans-Sabal. (New Mutants Annual#7/2 (fb) - BTS) - Eventually the Iraqi regime took the Arabian Knight's wives and children hostage to blackmail and force the hero into joining the Iraqi group of super powered mercenaries called Desert Sword. (Hulk Annual#20/3 (fb) - BTS) - The Knight agreed, but was secretly a double agent for the Pantheon, hoping to infiltrate Desert Sword. The people who were held hostages by the regime had actually been other Pantheon agents. (New Mutants Annual#7/2 (fb) - BTS) - When the Iraqi army learned that the German physicist Reinhold Kurtzmann was hiding in Kuwait, Desert Storm was ordered to retrieve him. (New Mutants Annual#7/2) - The American government team Freedom Force was under orders to retrieve Kurtzmann from Kuwait as well. Unbeknownst to them, Desert Sword had already captured the man and decided to kill Freedom Force as well. Before even revealing their full membership, Desert Sword managed to behead aging superspeedster Super Sabre, slice off one of Crimson Commando's hands and gravely injured Avalanche. Facing the surviving Freedom Force members, Desert Sword asked if the scientist was worth dying for. (Uncanny X-Men Annual I#15/2) - Desert Sword was caught off guard by the Blob who pulled off a surprise attack and lunged at Desert Sword, aided by Pyro and Avalanche. The three former villains managed to get the scientist and escape. Baffled, team leader Sirocco ordered Desert Sword to regroup. Then, the Arabian Knight was commanded to pursue the scientist along with Veil and Raazer, while he and Aminedi would try to destroy the others. Not willing to kill needlessly, the Knight lied when asked if he spotted Freedom Force. Raazer sensed his lie and threatened the Knight once again that his family would be killed if he didn't cooperate. The Knight gave in and revealed the Americans' whereabouts. While Raazer and Veil fought the Blob and Pyro, the Arabian Knight used his enchanted sash to retrieve Kurtzmann, but was powerless when Pyro resorted to a last ditch attempt to keep Kurtzmann's secrets out of Iraqi hands by killing the man with a fireblast. (X-Factor Annual#6/2) - Outnumbered, surviving Freedom Force members Pyro and Blob tried to outwit Desert Sword. Pyro burned Veil to death, while Raazer and the Arabian Knight stabbed the Blob with their weapons. However, Blob's mutant powers made him invulnerable to their assault. Pulling the golden scimitar and Raazer's sword out of his body, the Blob attacked and returned the favor, leaving the Knight critically wounded. Blob and Pyro took off, just as Raazer recovered and ordered a medical support team for the Knight. (Incredible Hulk Annual#20/3 (fb) - BTS) - While recovering from his injuries, the Arabian Knight learned that forces inside the Arabic nation of Trans-Sabal were planning to train and deploy muslim troops to deal with the crisis on the Balkan. The Arabian Knight tipped off his old friend the Hulk and the Pantheon. (Incredible Hulk Annual#20/3) - Pantheon members Achilles and Ajax traveled to Trans-Sabal to meet with the Arabian Knight. But when they got attacked by Trans-Sabal's Mandroids, it was the Arabian Knight who saved them by incapacitating the Mandroids. After introducing himself, and showing a newfound sense of humor, he shared both his findings and his undercover status in Trans-Sabal. The Knight led Achilles and Ajax to the Muslim forces, but then dropped a bombshell. He didn't want to stop the Balkan incursion, but aid them so they could help stop the ongoing ethnic cleansing in Bosnia-Herzegovina. Achilles was outraged at the idea of helping extremists. He attacked the Knight, ignoring his comparison to the holocaust. The argument was disrupted by the arrival of allied bombers that dropped bombs, decimating the base. With the troops wiped out, the Knight withdrew his request and went to tend to the surviving soldiers. Achilles and Ajax departed, but Achilles realized that the Knight had been right. (Marvel Comics Presents I#114/4 - BTS) - Finally rejoining his wives in Saudi Arabia, the Knight's life returned to normal, as he engaged in the simple tasks of going to the bazaar and returning with a lamb for supper. (Marvel Comics Presents I#114/4) - While at the local bazaar the Arabian Knight was caught off guard by an approaching sandstorm. Realizing this wasn't any ordinary sandstorm, he used his flying carpet to search for the source. He eventually found a super powered American soldier called Sandstorm who was responsible for the storm. The villain revealed he was once an imprisoned American prisoner who was exposed to dangerous chemicals that mutated him. Enraged by the harm that was done to him he swore to kill all Arabs. The Knight however, used his magic carpet to shield himself from the sand while using his sash to wrap Sandstorm, preventing him from choking on his own sand. Realizing the Arabian Knight wasn't evil, Sandstorm calmed down and thanked him. After inspiring him with sage advice, Arabian Knight saw Sandstorm off before returning home to face the displeasure of his family for not bringing home the lamb. (Thunderbolts I#55) - The Arabian Knight was flying on his carpet when he was among the 2400 random human beings drained of their lives when the mutant Humus Sapien was forced to use his powers in battle against the Redeemers in Mount Charteris, Colorado. The Knight fell off his carpet to his death, finishing what Humus Sapien's life drain started.